I usually don’t dream weird dreams. I usually dream about work, or about something I have to do the next day. Boring. But last night I had a really strange dream. I’ll tell you about it first, and then what I think it represented. The dream started with me arriving, as if by transporter, or warp in the space-time continuum, in a room. It was obvious there was no way of going back where I’d come from. There was a doorway or hall, and women were coming in or walking through in small, quiet groups. I was pleading with them to tell me where I was, who they were, where I should go, what I should do. They could see I was lost, and seemed sympathetic, but couldn’t understand what I was asking, and I couldn’t understand them. They took me to another room where I met with an older woman who seemed to be their spiritual leader or counselor. She could see I was very upset by this time, but she too could not give me any answers. Through body language and touch she let me know that I was safe there, and that she understood, if not my story, at least what I was feeling, and that I was OK.
At first glance I figured I must be watching too much Star Trek, and didn’t give it a lot of thought. But as I started going over the details in my mind I came to a different interpretation. The rooms were simple and plain, white and wood, with no decoration. The women were soft-spoken, and clearly part of a tight community where they knew and understood each other without a lot of talking. They were all dressed alike, in loose-fitting cotton garments in subdued tans and beiges. I was in a new world, with a new language, and it was clear I was going to be spending the rest of my life there. I felt utterly lost. I couldn’t understand what was going on, or what was being said, and was sad and frightened about that. I didn’t know what to do, what was expected of me, or how to find out. Their leader, who clearly had the confidence of the others, was kind and sympathetic, but could not give me any answers, only reassurance and support. I knew they were good people, that I was safe, and that they were willing to accept me into their community. 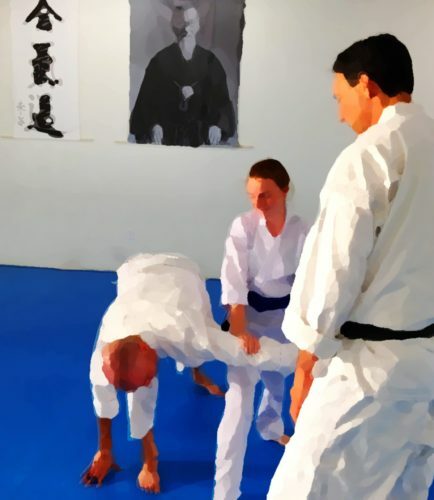 Given my frustration in class yesterday over feeling completely incompetent, along with the past week’s sense of feeling closed off or guarded, I’m thinking the dream was showing me a picture of Aikido. It’s a new world, a new language, a new community. Most answers can’t be gotten by simply asking. My usual ways of learning don’t work. It’s understood that I’m lost. But I’m safe, among friends, with a caring, perceptive leader, and in time will feel at home.